When you think about healthy teeth and gums, does the food you put into your mouth ever come to mind? If not, it should, because tooth decay starts with what you eat. Your diet affects your dental health in addition to your overall health and well being! Establishing good diet and nutrition habits with your toddlers and teenagers helps them make better diet decisions for their teeth and their general health, although, even as adults, it’s never too late to start! We have plenty of ideas for healthy eating that will keep your teeth and gums in tip-top shape. Call us for suggestions or to schedule an appointment for a thorough examination to determine how your diet is affecting your teeth. You may have heard, “You are what you eat,” and where your oral health is concerned, this is no exception. Tooth decay starts with the foods you put into your mouth. When you don’t brush and floss frequently or correctly, plaque forms on your tooth surfaces, and this plaque just loves it when you eat starchy or sugary foods! The starches and sugars combine with the plaque to produce an acid that eats away at your tooth enamel, resulting in tooth decay (cavities) or gum disease. Try to eat healthy foods and avoid sugary snacks and drinks that cause tooth decay. Even if you have a sweet tooth, you can certainly find a way to fit some healthy snack choices into your daily diet. Water – helps to wash down the sugar you do eat so it doesn’t attach itself to plaque. Fruits and vegetables – especially those that contain Vitamin C, which is beneficial to maintain healthy gums. Many, such as apples and pears, contain a high water content, which helps to neutralize the sugars they contain and stimulate saliva production that helps to remove food particles that have become lodged in the teeth. Dairy products – provide calcium which is essential to healthy tooth development (like bones!) and re-depositing enamel on teeth that has been lost through acid erosion. 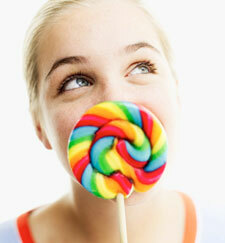 Avoid sugary snacks which eat away at your tooth enamel, resulting in tooth decay and gum disease. Avoid sugary snacks and beverages, such as sodas, lemonades, teas and coffees with added sugar, especially if you tend to sip them all day, depositing a sizable amount of sugar on your teeth. Lollipops, sticky candies (i.e., licorice and “gummy” snacks), hard candies, cookies, cakes, pies, pretzels and potato chips are not very good snack choices due to the sugar overload they leave in your mouth, not to mention the “empty” calories they contain. Proper dental hygiene, such as twice daily brushing and once daily flossing, regular dental cleanings and examinations, and brushing after eating sugary snacks help to minimize the effects of poor diet choices on your teeth. Please give us a call if it’s been awhile since your last professional cleaning and examination. Don’t allow “small” decay problems to become large ones that can affect your smile and your wallet!